One month ago, we started our trip in Sri Lanka, a country slightly smaller than Ireland and home to around 21 million people. 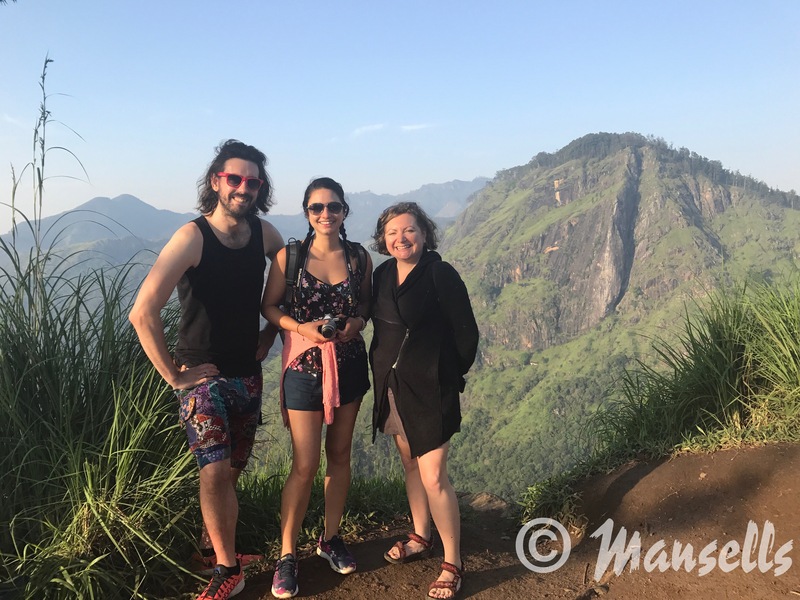 We chose Sri Lanka as our first destination partly due to its smaller size (compared with India and Thailand), a few recommendations from friends and the appealing array of activities the island has to offer. For example, you can relax on the endless stretches of beautiful white sandy beaches on the south coast, walk amongst tea plantations in the hill country, spot wildlife such as elephants and leopards in some of the national parks and visit the many temples and ancient Buddhist relics in the cultural triangle in the middle of the country. Sri Lanka offered a bit of everything and would be an excellent start to our trip. 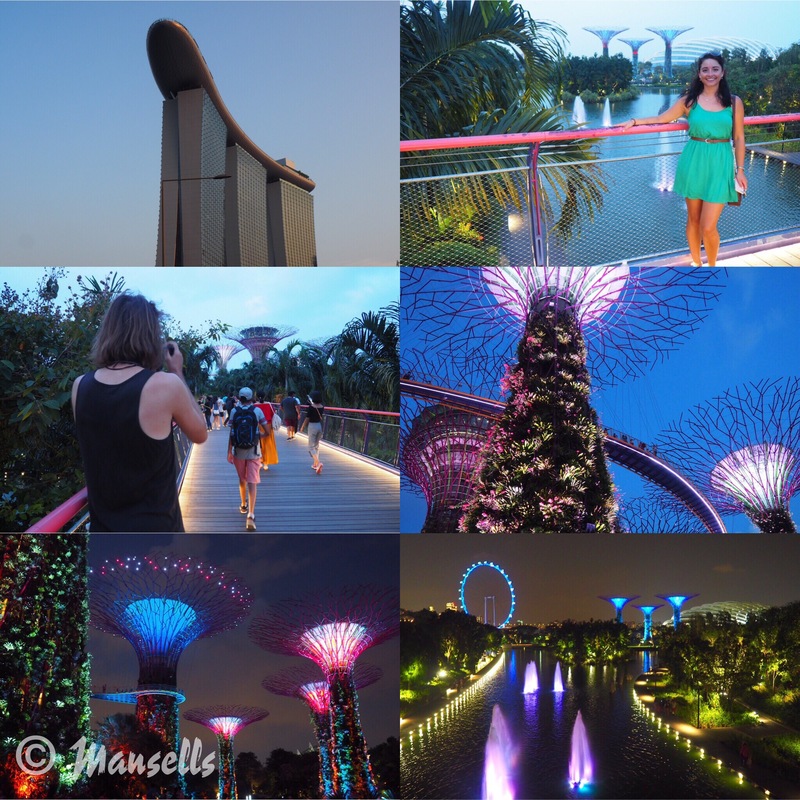 These photos show you some of the highlights of our trip! If you’re interested in hearing more, keep reading! When we set out, we didn’t have an exact agenda other than we wanted to spend our first few days on a beach to completely zone out and relax. Other than a few European city breaks, we’d not had a holiday together for over a year, let alone a beach one – not since our honeymoon in 2015! Therefore we decided our first stop would be Hikkaduwa, which the guidebooks describe as a hippy beach town. 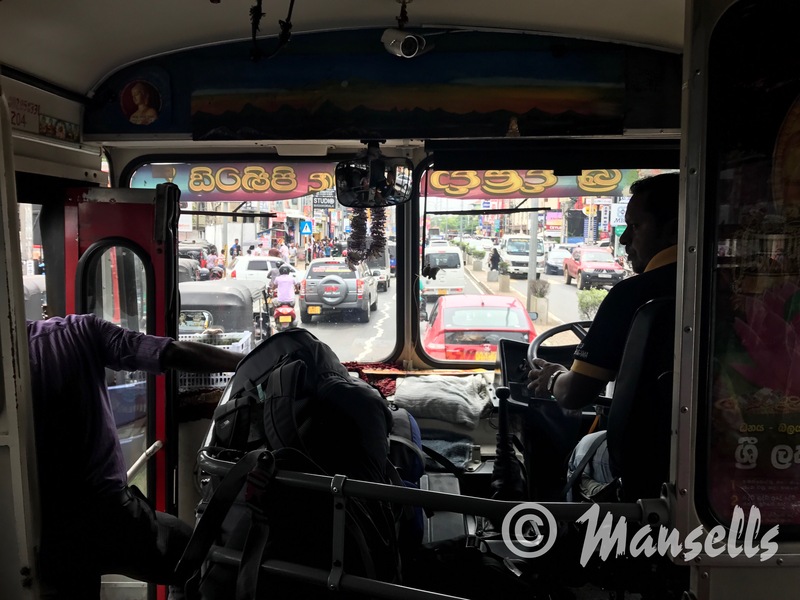 To get there from Colombo airport (where all the international flights fly into) we got the 187 bus from the airport to the city centre and then had a a very brisk walk with our backpacks to the train station to catch the last train to Galle at 7.30pm. Unfortunately, it was dark by this point to see out of the window but we could tell train hugged the coastline so I imagine if you did this in the day the views would be wonderful. 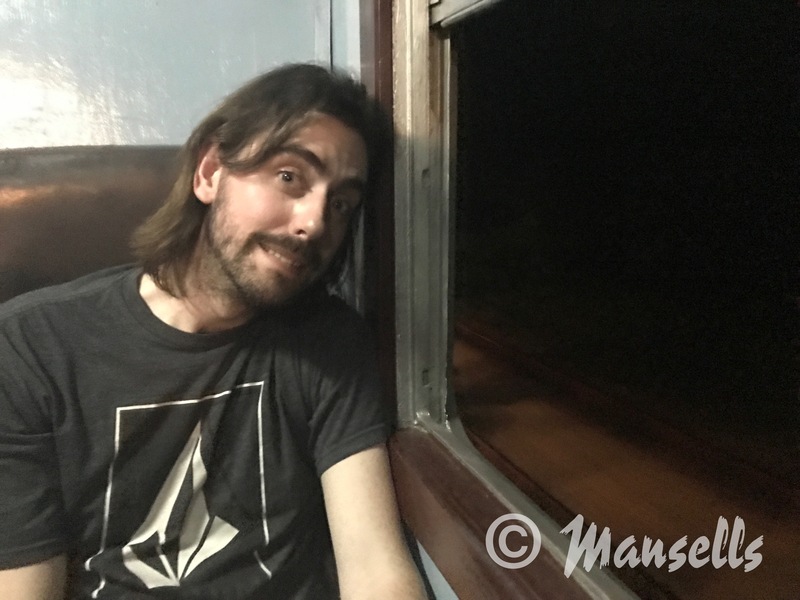 Jonny on the train from Colombo to Hikkaduwa. Although we could hear the sea and get occasional glimpses in the moonlight, most of the journey was darkness. We arrived in Hikkaduwa about 11pm and took a tuk -tuk to our guesthouse- Why Not Guesthouse. Apart from a bar on the beach everything was pretty sleepy and we struggled to even find the owner to get into our room. Finally though, we got into our room for the night after a 14 hour flight, 1 hour bus journey and 3.5 hour train ride! We were shattered and fell asleep quickly to start afresh the next day. We woke up to a stunning sandy coast line fringed with palm trees. 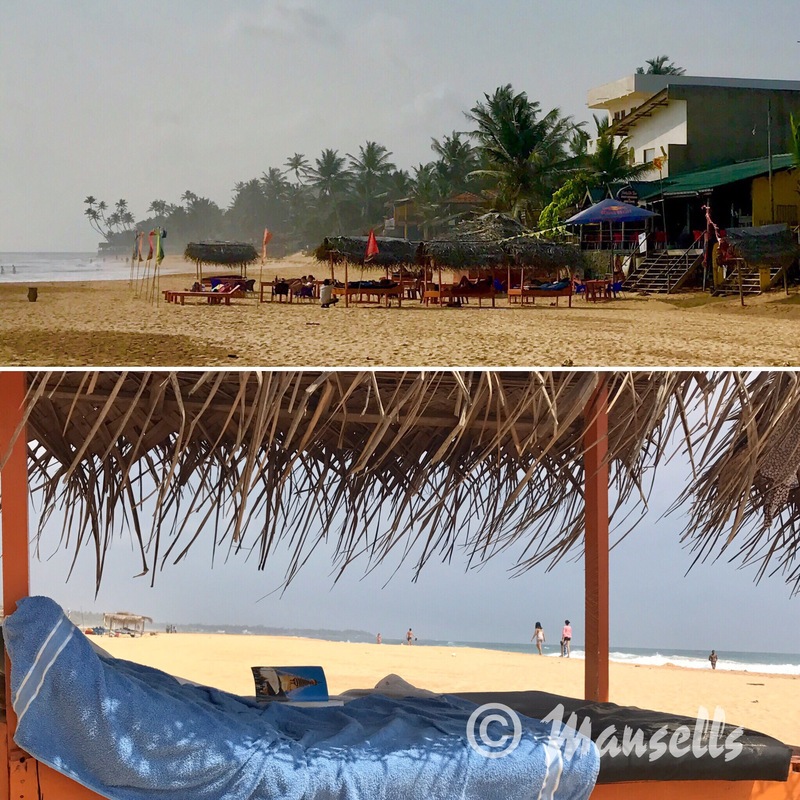 Although there were a number of surfer-style beach cafes, it was fairly quiet – perhaps due to the time of year we were there. 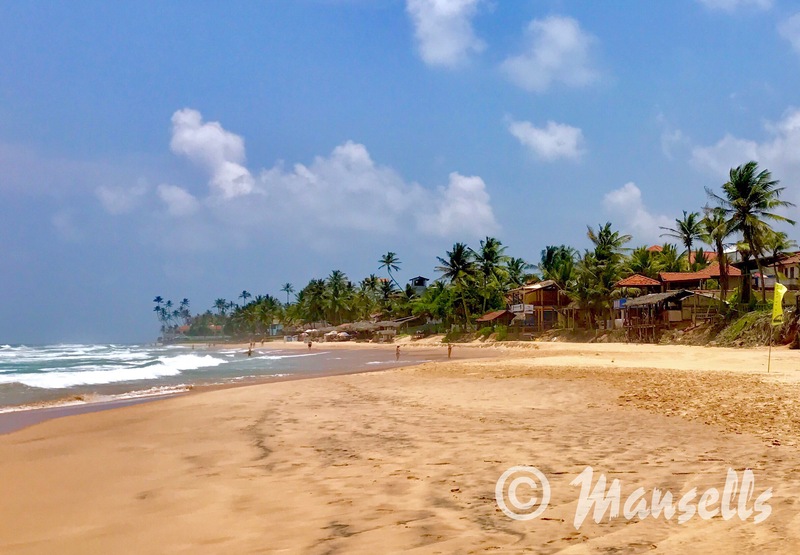 We took our time in Hikkaduwa and the laid-back surfer vibe perfectly suited us so we stayed for 3 nights. We chose this cafe for breakfast and got a bed (owned by the cafe) free of charge for the rest of the day – perfect for relaxing and great for shade as it gets pretty hot! Most of the beach cafes offered sun loungers and umbrellas free of charge so long as you bought a drink or food from the cafe. 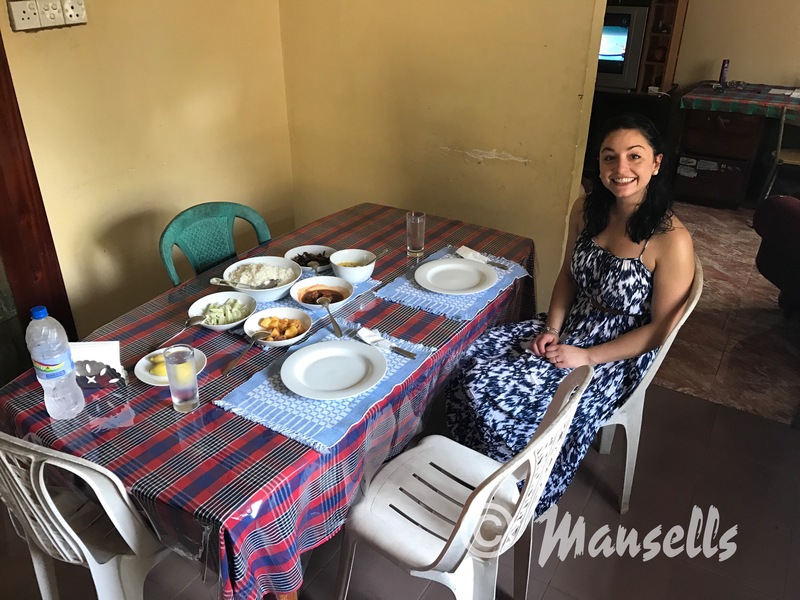 Prices were slightly more expensive than more northern areas of Sri Lanka but by English standards it was still pretty cheap with meals ranging from £2-6 on average. A Sri Lankan curry we had in Hikkaduwa. Big plate of rice and lots of smaller dishes, costing roughly £4. We also visited the tsunami centre as we were interested in how the Tsunami in Dec 2004 had affected people here. Nearby was a turtle sanctuary which helped to both breed endangered and take in injured turtles. 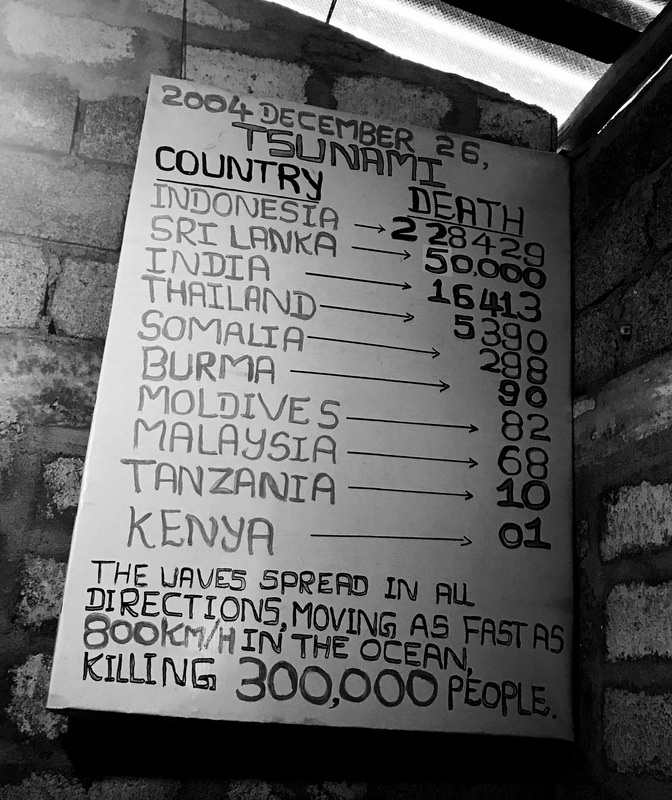 The very sobering and heartbreaking reality of the 2004 Tsunami. Many of the people we spoke to had been affected by the Tsunami but it was inspiring to hear how they had rebuilt their lives. 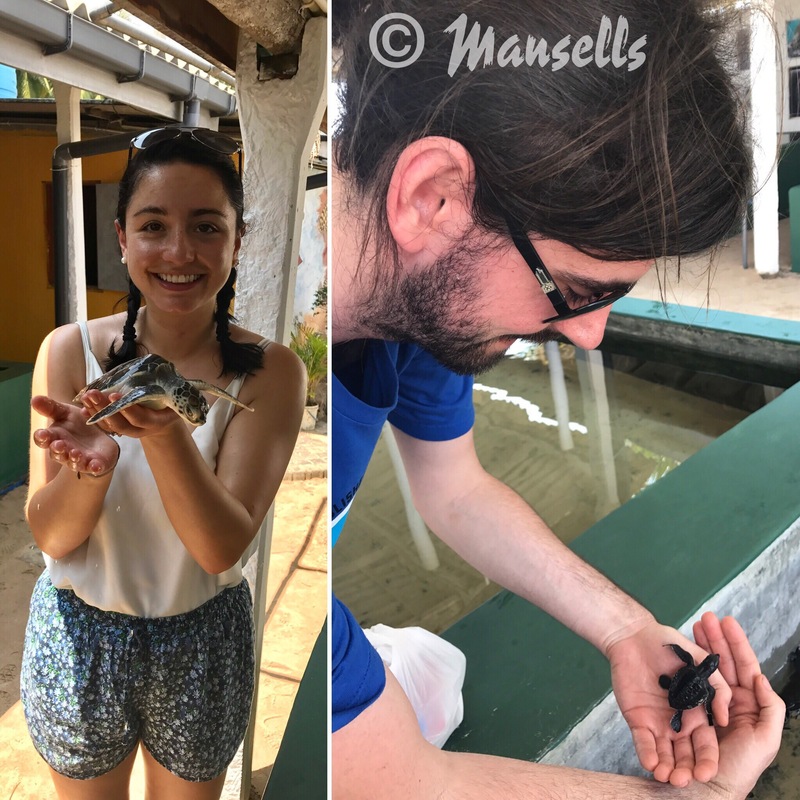 The turtle sanctuary in Hikkaduwa. In the evening we helped release 200 baby turtles back into the sea. 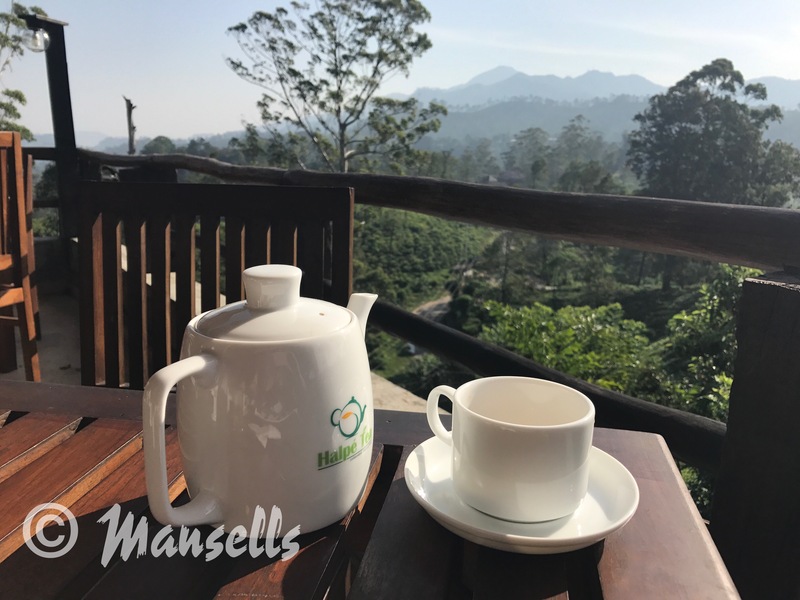 From Hikkaduwa, we created a rough 3-week itinerary; explore a little more of the south coast before heading inland to the national parks to spot wildlife and the hill country to explore the tea plantations. After the hill country, we would go to the cultural triangle in the middle of the country and then try and accommodate a little bit of beach time before heading to India. 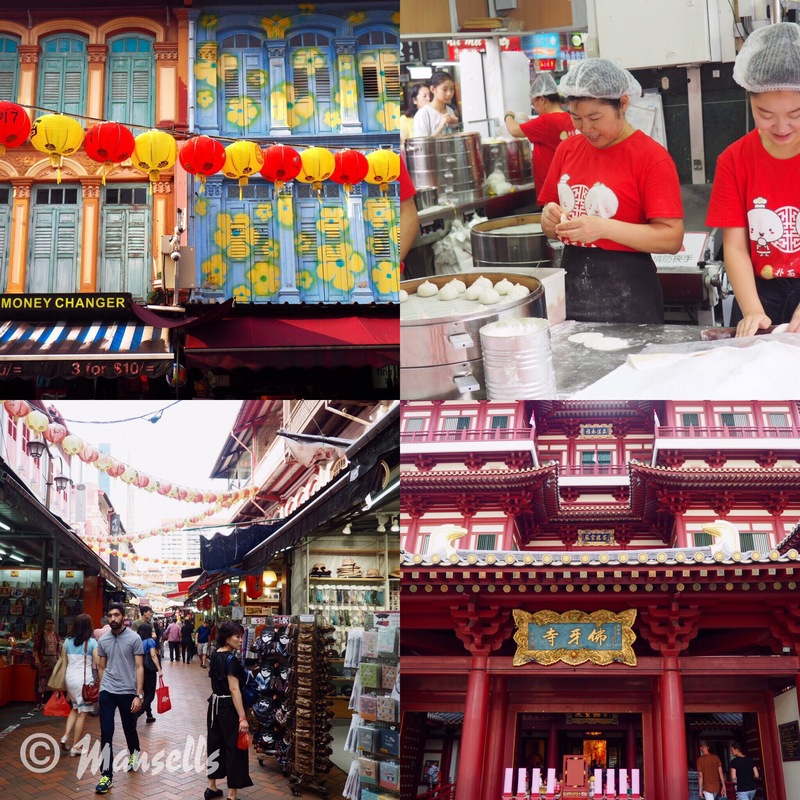 We pretty much stuck to this itinerary which involved us moving from place to place every 2-3 days. 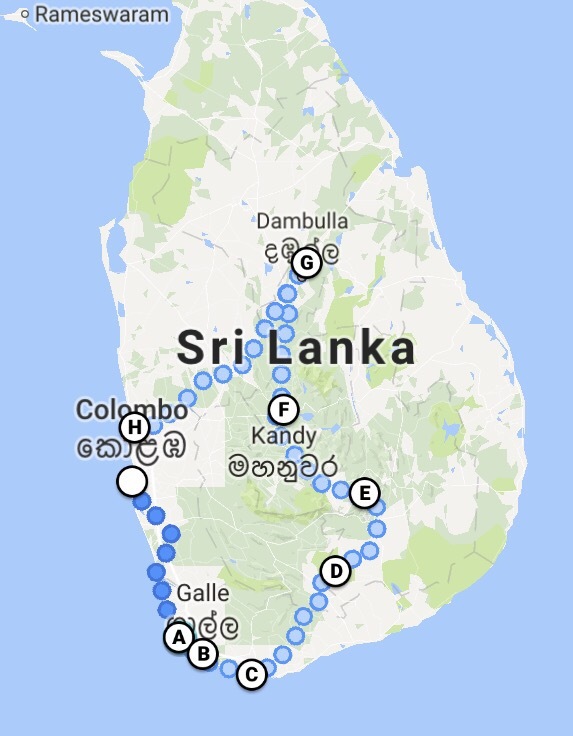 Our route through Sri Lanka (taken from Google maps). We took a bus from Hikkaduwa to Galle, a Dutch colonial town within old fort walls. We just spent one afternoon here and stayed in a homestay for one night where the family cooked us lunch (Sri Lanka rice and curry) and made us breakfast the next morning. 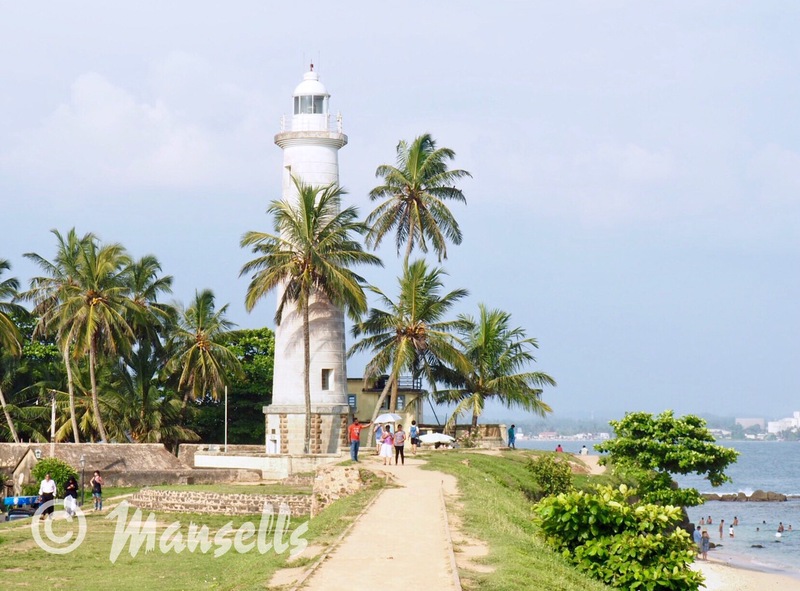 The lighthouse in Galle built by the Dutch in 1938. 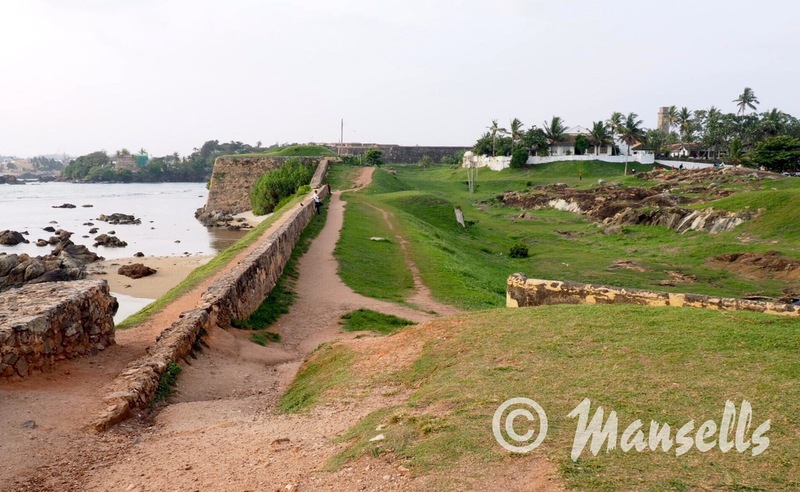 Walking along the fort walls in Galle. Our host at our first homestay. 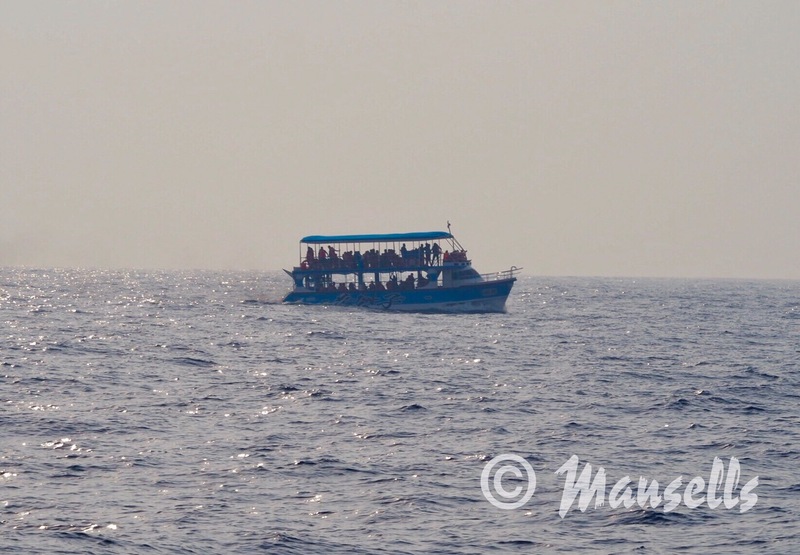 Then we took the bus along the coast a bit further to Mirissa, another beach town with a particular attraction of whale watching. We bought a tour package for 4000rs each (roughly £20) and departed at 7am (all the boats depart early) and the trip in total was about 4 hours. We went pretty far out to sea and it took about 2 hours before we saw anything! The sea was rough so if you get sea sick easily, you may not enjoy this trip as much (I have never been sea sick, but even I was struggling!). 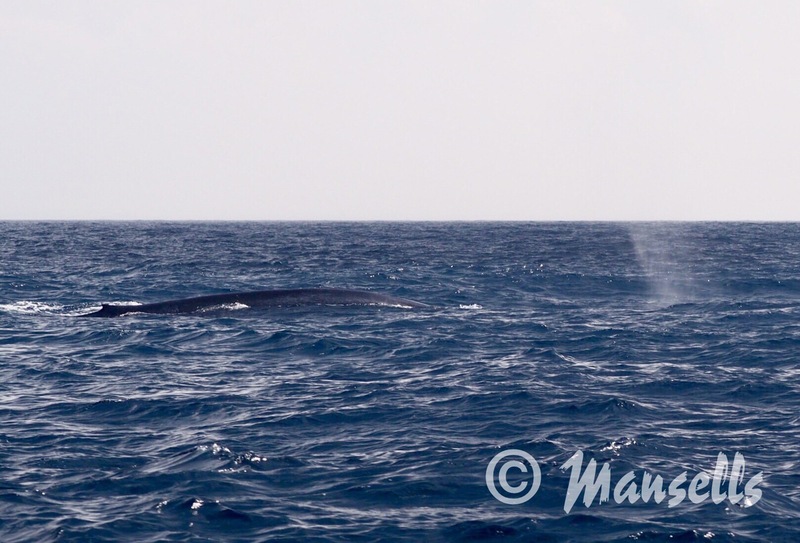 In total we caught glimpses of three blue whales which was incredible – the largest mammal on the planet. Getting tea before the ferry departs. 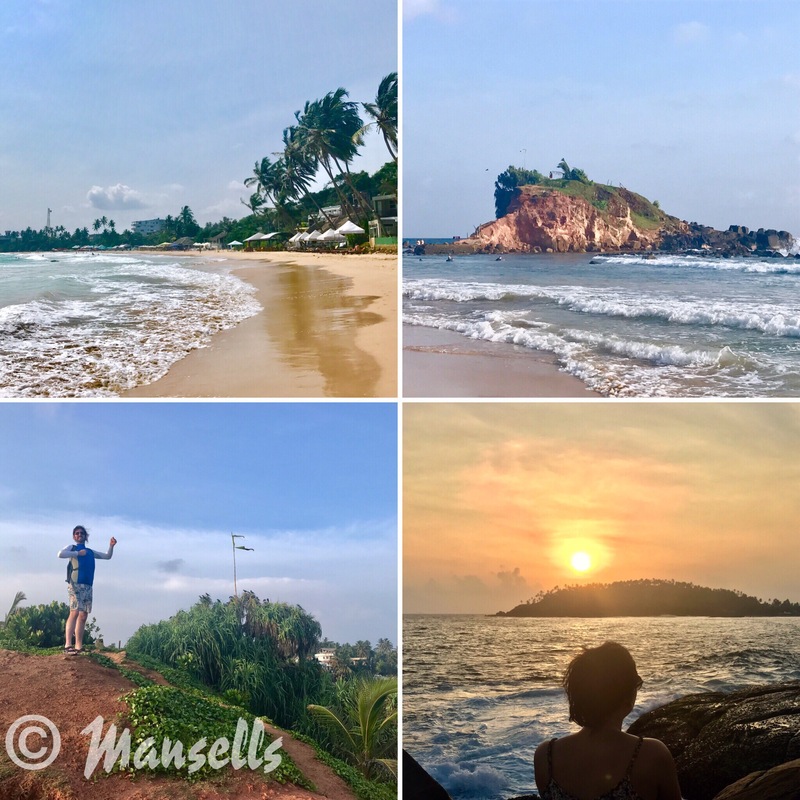 The beach was nice in Mirissa and we climbed up a rock to watch the gorgeous sunset. 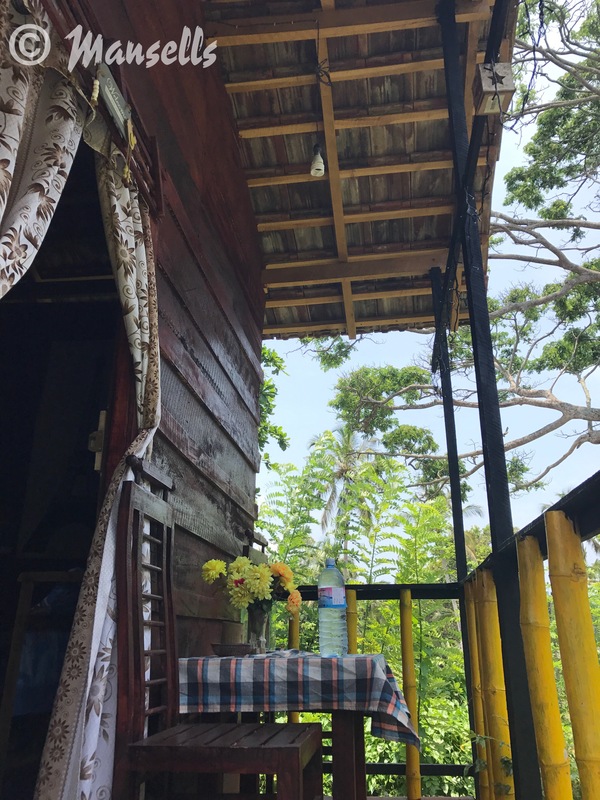 We stayed in a tree house called Bird House in Mirissa for two nights. It was great to be amongst the trees listening to the birds and felt much more rural than the previous homes and guest houses. Though it was a wooden hut so we were a tiny bit scared of what insects could get in (Sara especially of spiders!!). We were lucky though and had a very pleasant stay. 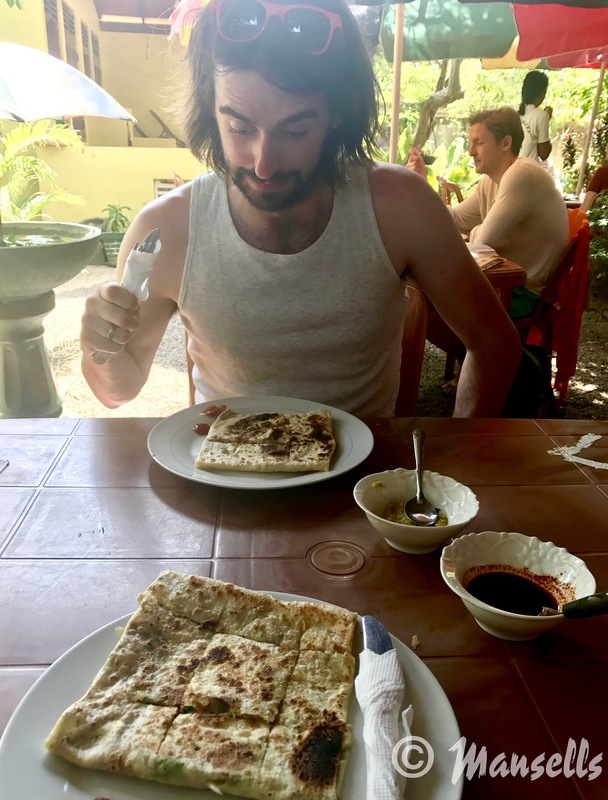 In Mirissa we found Dewani Roti shop, a wonderful little cafe tucked away. 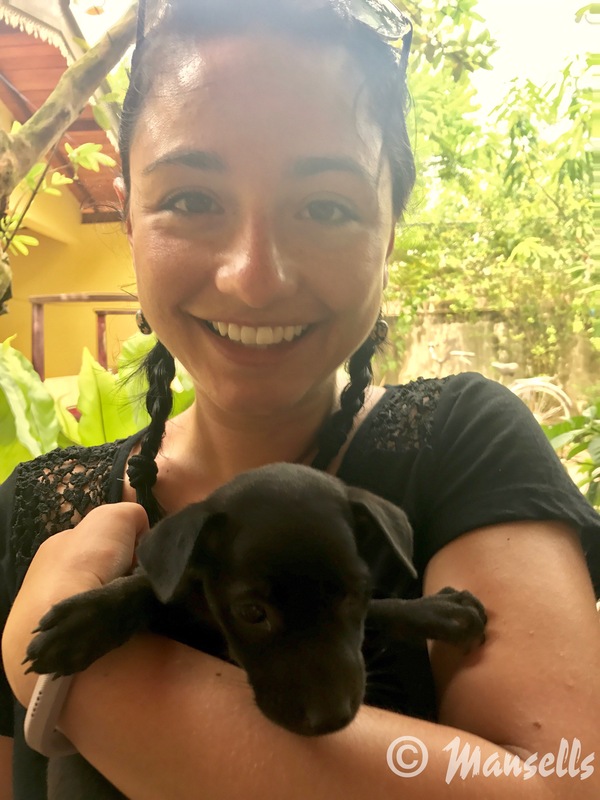 It also had puppies so we were sold (we even went back the next morning for breakfast!). 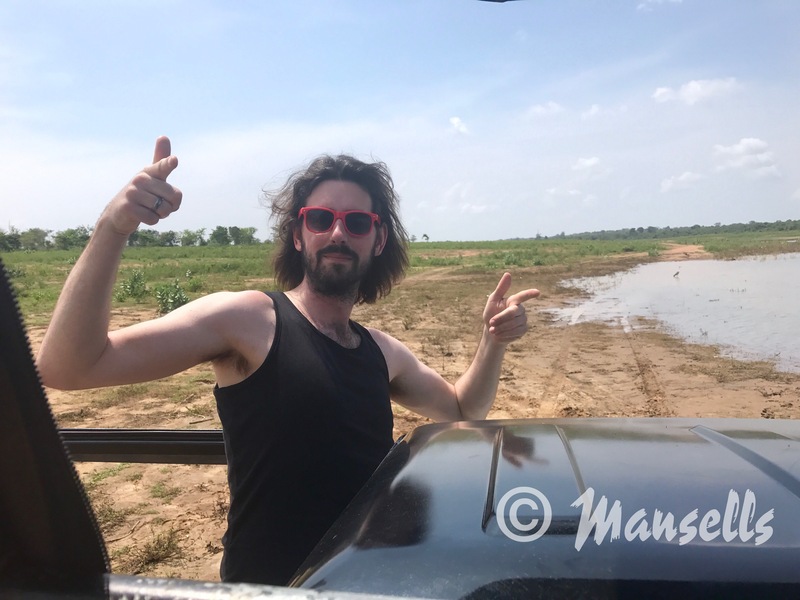 We also spent a lot of time deliberating whether our next stop would be a safari in Udawalawe National Park or Yala National Park. Yala seemed bigger and had more wildlife to see but was more out of our way and potentially more touristy with people often saying they saw more jeeps than wildlife. 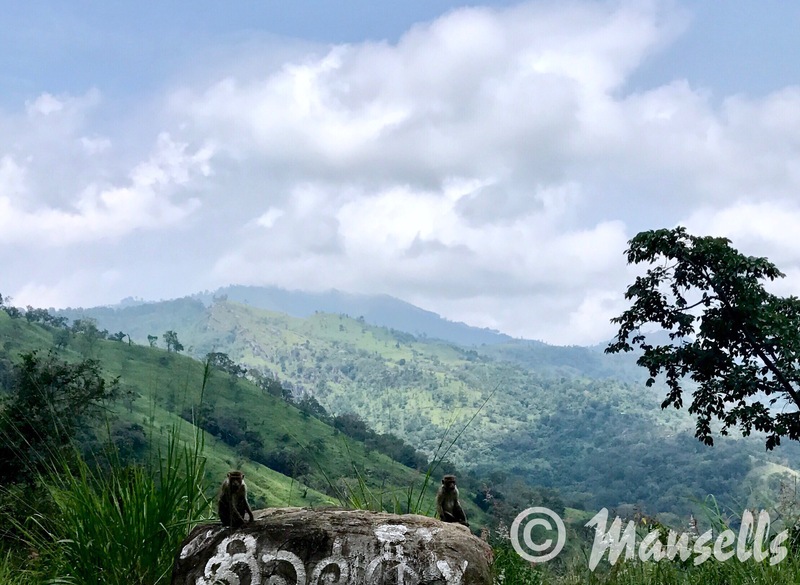 In the end, this blog post helped us decide on Udawalawe National Park. To get to Udawalawa, the journey was a bit more complicated with three buses which took about 4-5 hours. In general, the buses don’t tend to leave until they are full but that doesn’t seem to take very long! 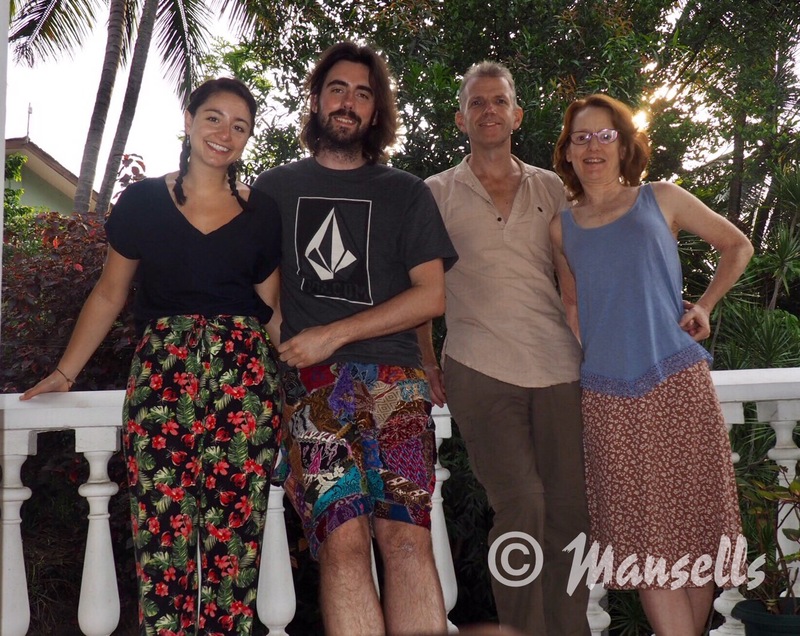 We stayed at Ruwanpura homestay in Udawalawa and the family were lovely. Janaka and his wife Udari cooked us lovely meals and their son was also very sweet to play with. Our host family at Ruwanpura homestay. Ruwanpura organised a safari by the owner’s nephew, at a very reasonable price of 4000rs including breakfast and entrance to Udawalawe National Park. You need a jeep to enter so the cost goes down depending on how full the jeep is (they seat 6, 7 if someone sits in the front). We had to get up very early for the Safari as this is the best time to catch the wildlife (later on it is too hot and they tend to become less active, seeking shade!). 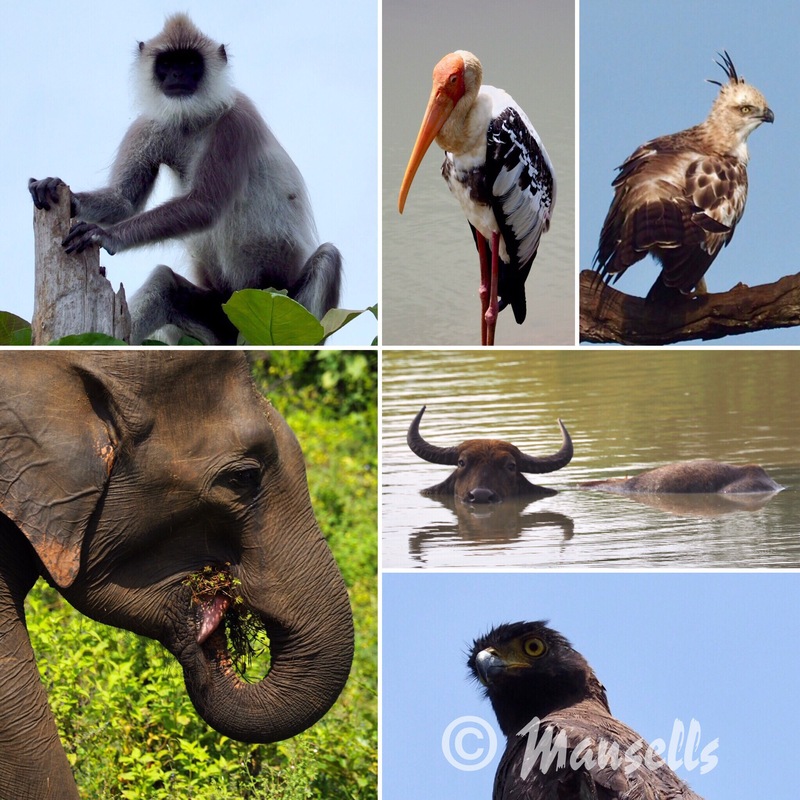 We were very lucky and saw lots of elephants, monkeys, deer, crocodiles, buffalo and a great variety of birds including peacocks, eagles, parrots, kingfishers and painted stork. Some of the beautiful animals we were lucky enough to spot in Udawalawa National Park. We stayed at this place during the Sri Lankan New Year April 13th-15th, the biggest national holiday of the year. The children were off school and fire cracker fireworks could be heard all throughout this period. The children at our homestay were very excited by them and always invited us to watch when they got set off. 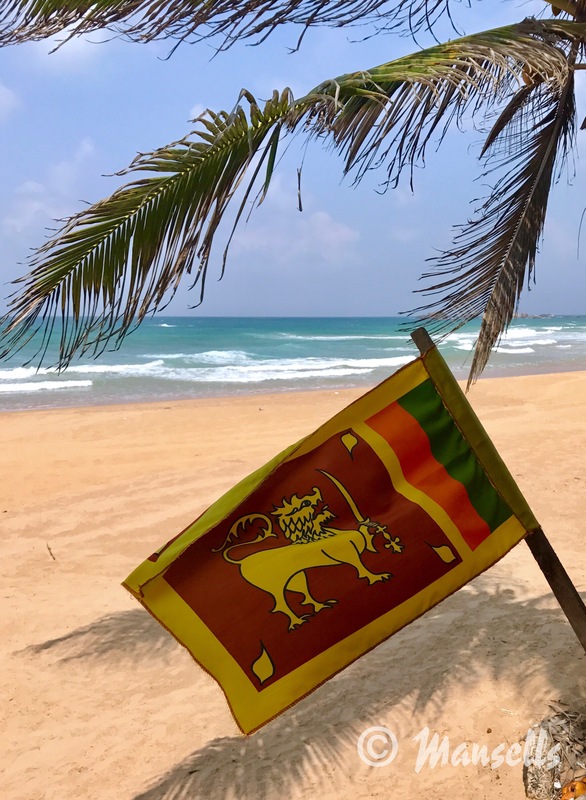 It was really fun to celebrate the Sri Lankan New Year, however the only downside is that most tourist sights will close during this period, buses stop running and restaurants close. The family made us a lovely New Year themed breakfast with Kokis, milk rice and Kevum. 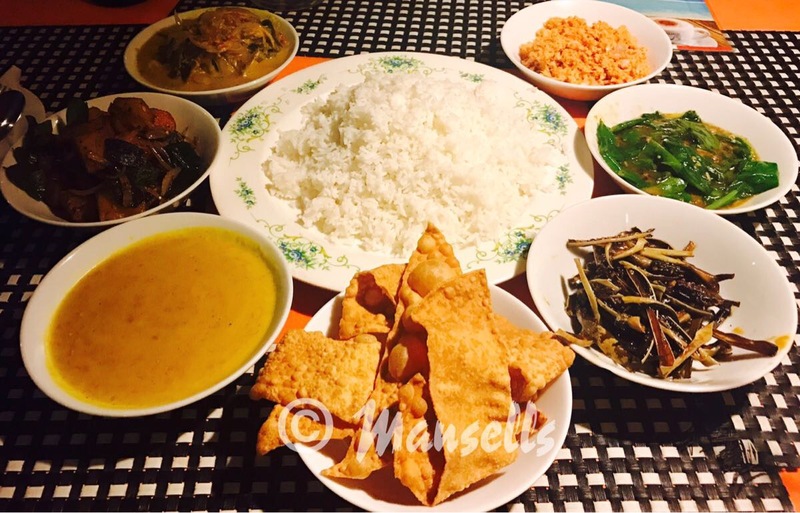 Our New Year Srilankan breakfast. Our next journey was to Ella up in the hills amongst tea plantations. We got a little caught out by the New Year as there were no buses leaving Udawalawa. A tuk-tuk driver offered to take us and so we took a 2.5 hour trip up into the hills. The drive was spectacular and you could feel the cold air as we climbed higher. 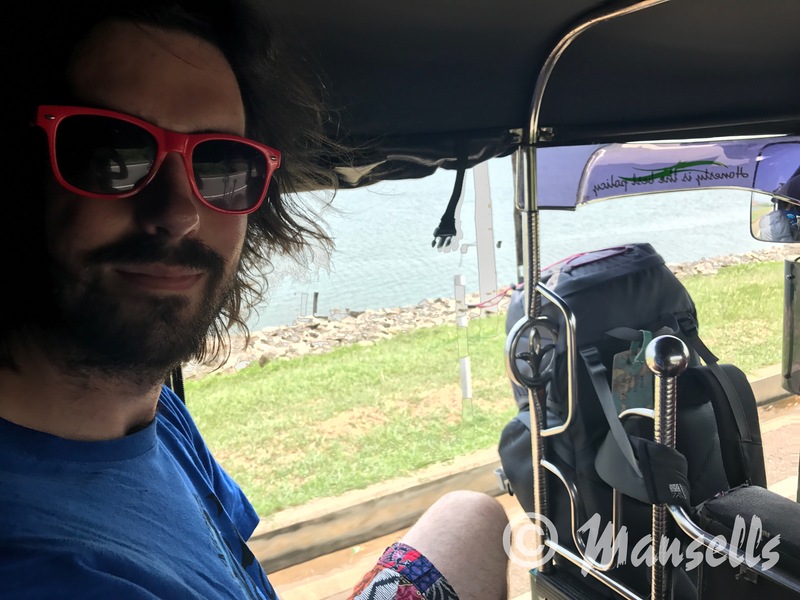 Jonny in the tuk-tuk – a 2 hour drive up to Ella. The views started to become very impressive from the tuk-tuk ride up! Even the monkeys were impressed! We checked in to our accommodation, where we received more traditional Sri Lankan New Year sweets. There was a monsoon shower so we chilled on our balcony for a bit before walking to Ella Spice Garden to see if we could do a cooking course. As it was New Year, sadly the cooking course was not being offered but the owner was happy to give us a tour around his spice garden for 100 LKR each. Although the garden small, it was worth the money with the kind man talking us through his homegrown cinnamon, ginger, turmeric, vanilla, cardamom, assortment of chillis and more. It was interesting to hear the process of how they are turned into the herbs & spices we see in the shops. 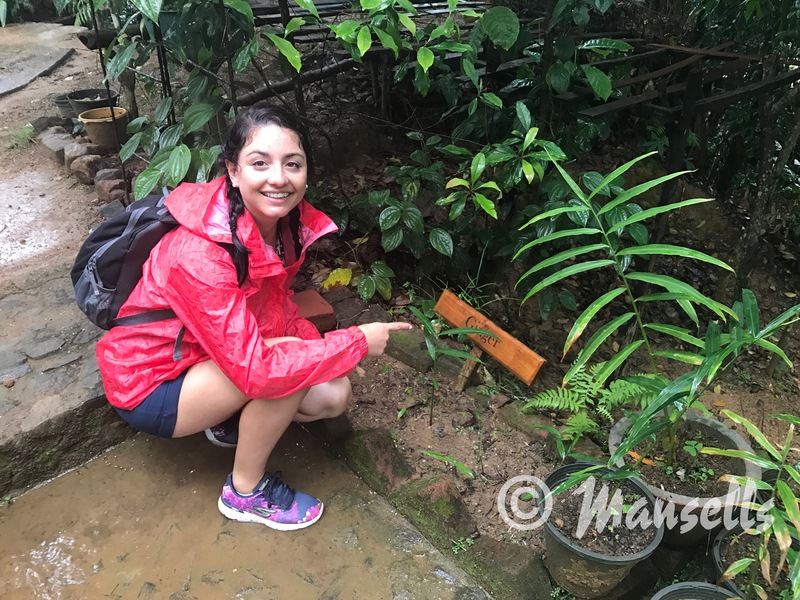 In the spice garden – here you can see a ginger plant. A lot of the restaurants were closed in Ella due to the New Year period but we managed to find one that served us Sri Lanka curry. We decided to have a fairly early night as we planned to get up at 5am to climb little Adam’s peak for sunrise. Upon getting back to our room, we met our neighbour, a girl called Felicity and she decided to join us for the early morning walk. 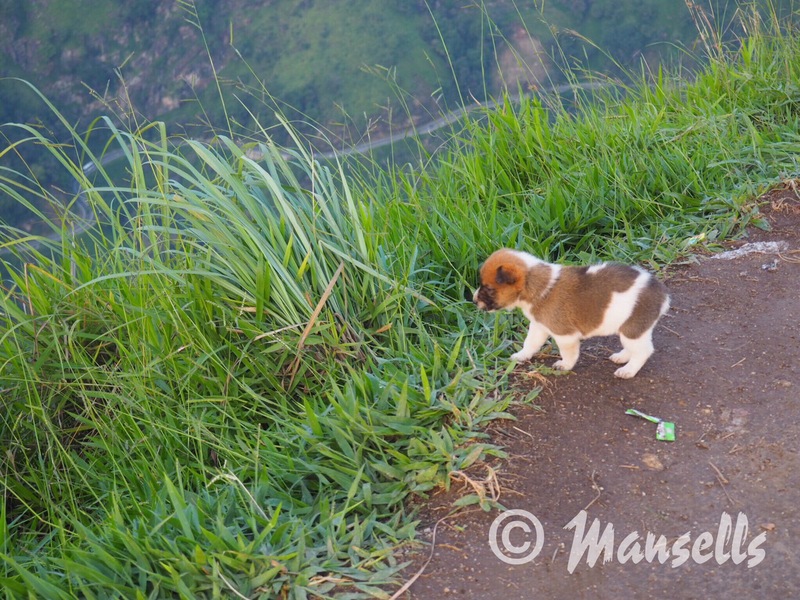 The sunrise was beautiful and there were two puppies at the top of the peak who were eager to see hello! One even fell asleep on my lap! 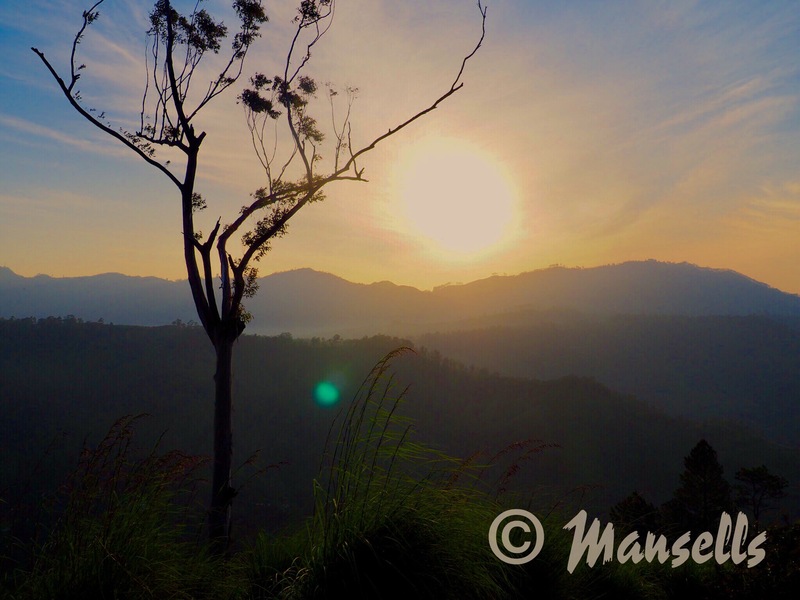 Watching the sunrise from Little Adam’s peak. One of the puppies getting a little too close to the edge! 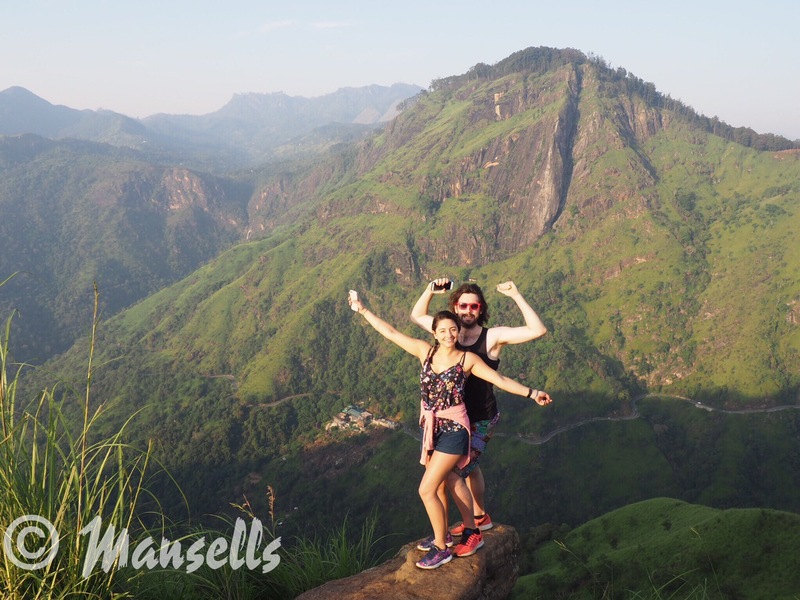 Climbing Little Adam’s peak with Felicity, our room neighbour! On our way down we went to 98 acres hotel which was an incredible place overlooking the tea plantations. We decided to reward ourself with breakfast, it wasn’t cheap at 1900 LKR but the breakfast was fabulous, buffet style wth both western and Sri Lankan food and egg hoppers which were made right in front of you! The view from 98 Acres Resort where we had breakfast after climbing Little Adam’s peak for sunrise. Later the same day, we checked out the nine arch bridge which is an impressive viaduct still in use. It was a fair walk down to it in the heat (including walking along the railway tracks!) but we were lucky as when we arrived we were able to witness a train going over it. The nine arch bridge in Ella. As well as the bridge, we’d hoped to check out Uva Halpawette Tea Factory but unfortunately it was closed due to the Sri Lankan new year. 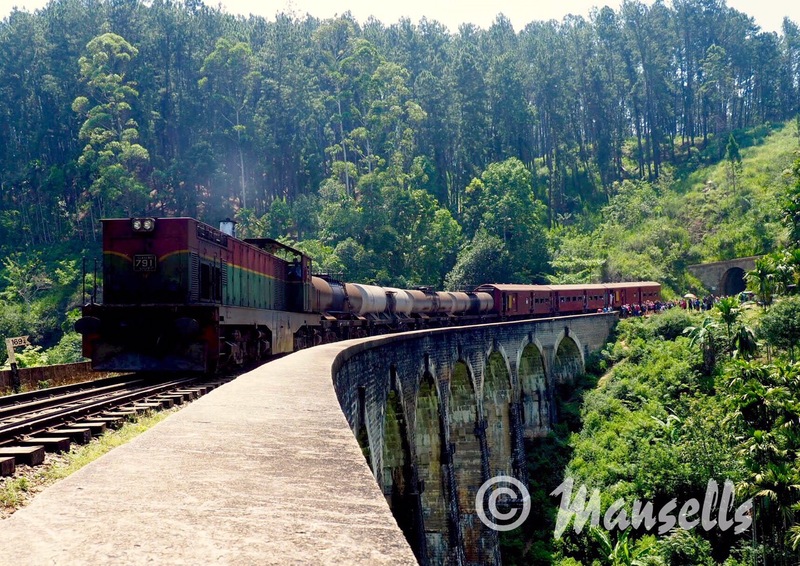 The next day, we headed to Kandy via the classic train ride through the hills- they say it is the world’s most scenic train ride. The first class tickets had sold out so we decided to get up super early and go to Badulla station which was the first stop. We got to Badulla train station an hour before the train left the station and managed to bag two seats. By the time the train stopped at Ella, the carriages were packed out. The train ride took about 7 hours but the scenery was stunning throughout the journey. The train carriage we were in was completely packed out and with many people standing so I can imagine this could hinder the experience a bit for the people without seats. 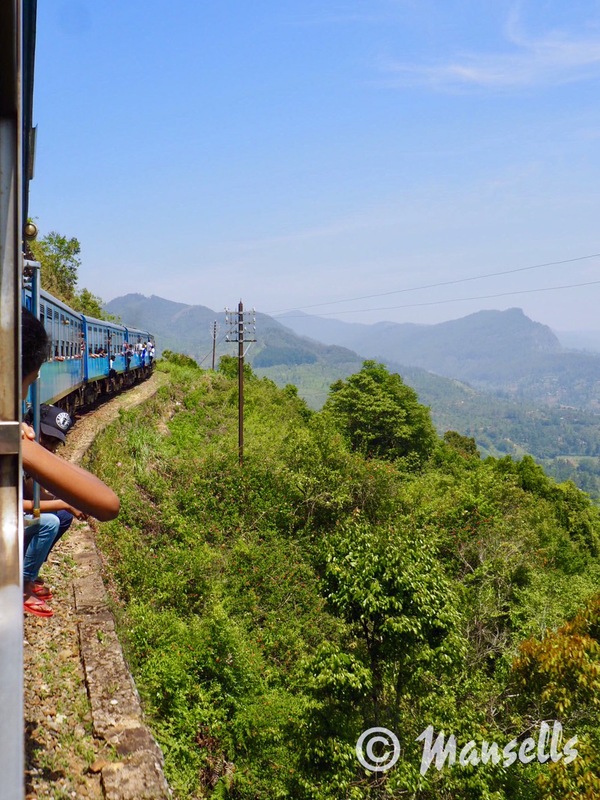 The most scenic train ride in the world between Ella and Kandy. If you don’t manage to book a 1st class carriage then you’ll likely be in overcrowded 2nd class. We were so lucky we had seats! In Kandy, we were lucky enough to stay with friends who were based close to Peradeniya University. After being wonderful hosts and great company, we owe them big time! 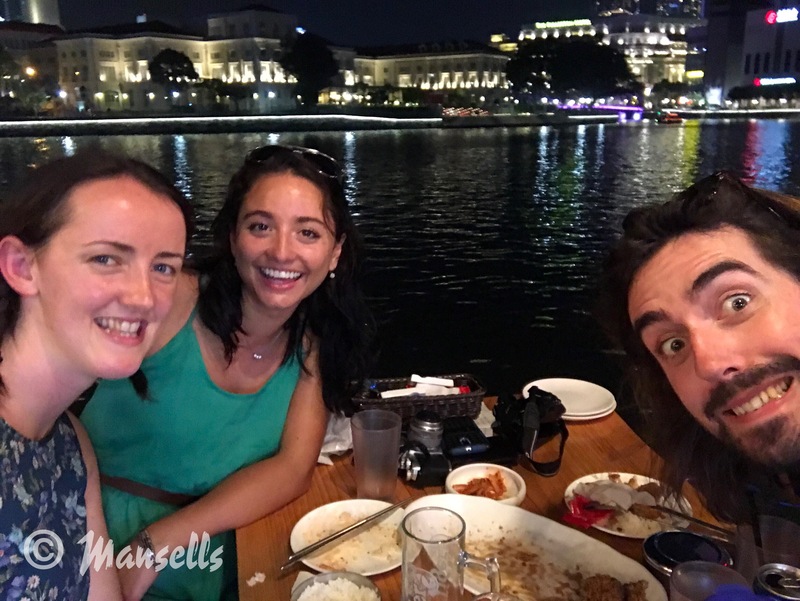 We stayed for two nights in Kandy with Matt and Leonie. 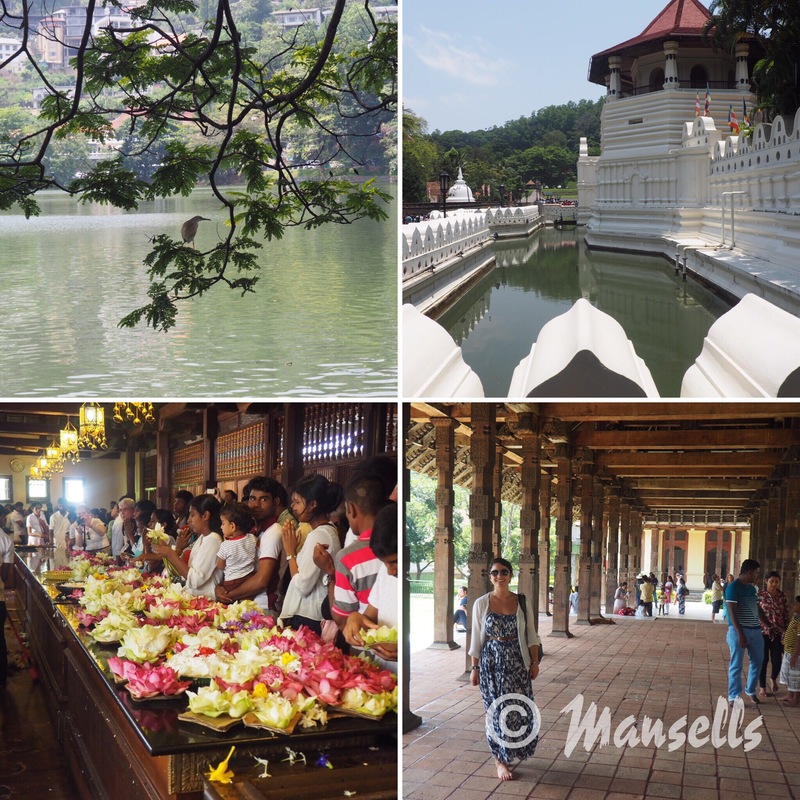 We did the touristy activities such as the Temple of the Tooth in Kandy and strolled along the lake. 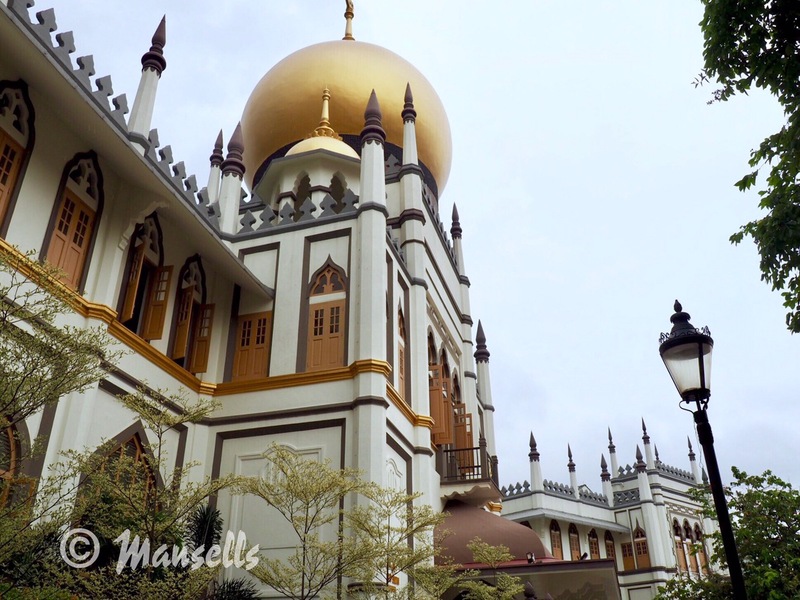 We took respite near the temple at the Old Empire Cafe, built in the British colonial era. The Temple of the Tooth by the lake in Kandy. 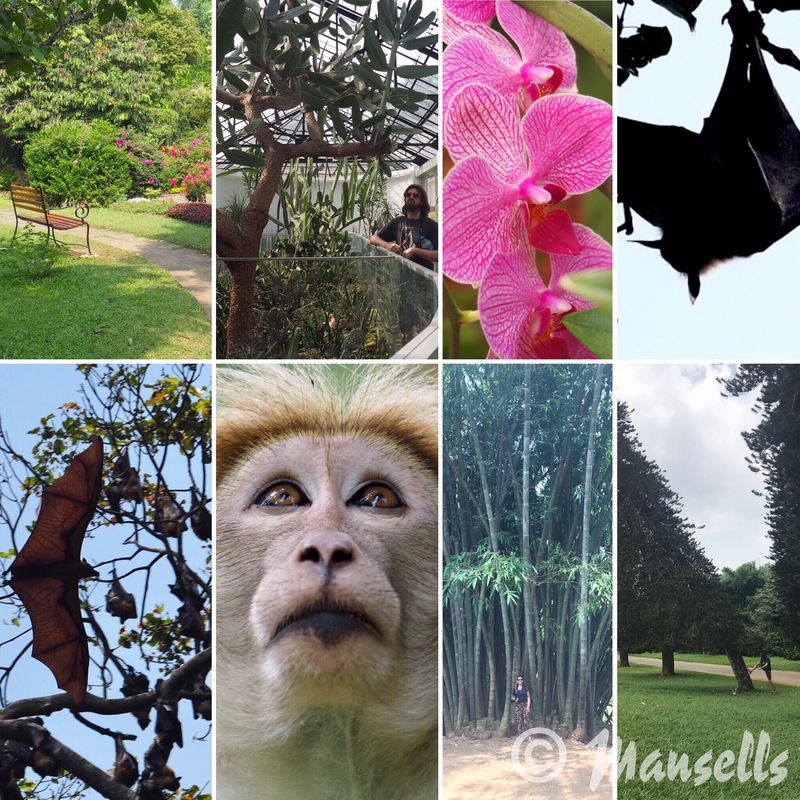 We spent the next morning in Peradeniya Botanic Gardens where we saw lots of fruit bats and monkeys. Our next destination was to probably the most distinctive landmark in Sri Lanka- Sigiriya Rock. 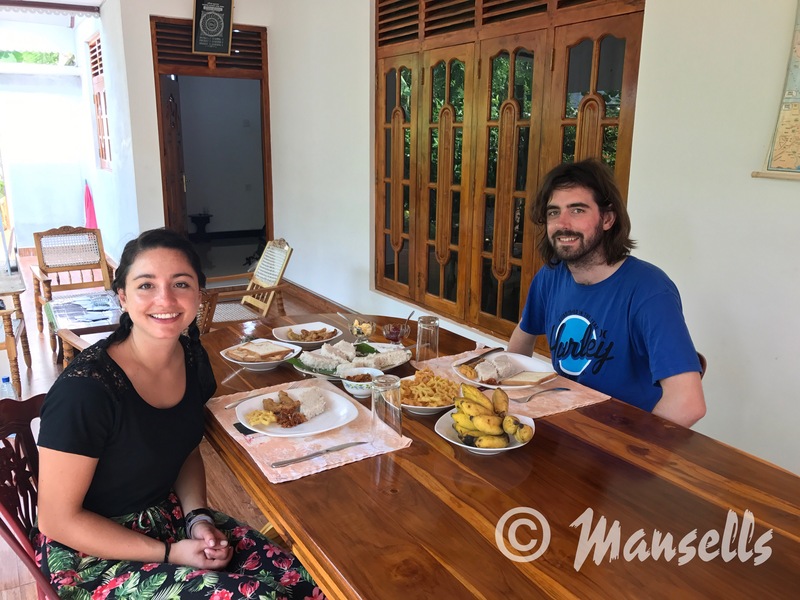 We stayed at ‘Homly Guesthouse’ in Habarana which was situated between Sigiriya, Dambulla and Polonawura. 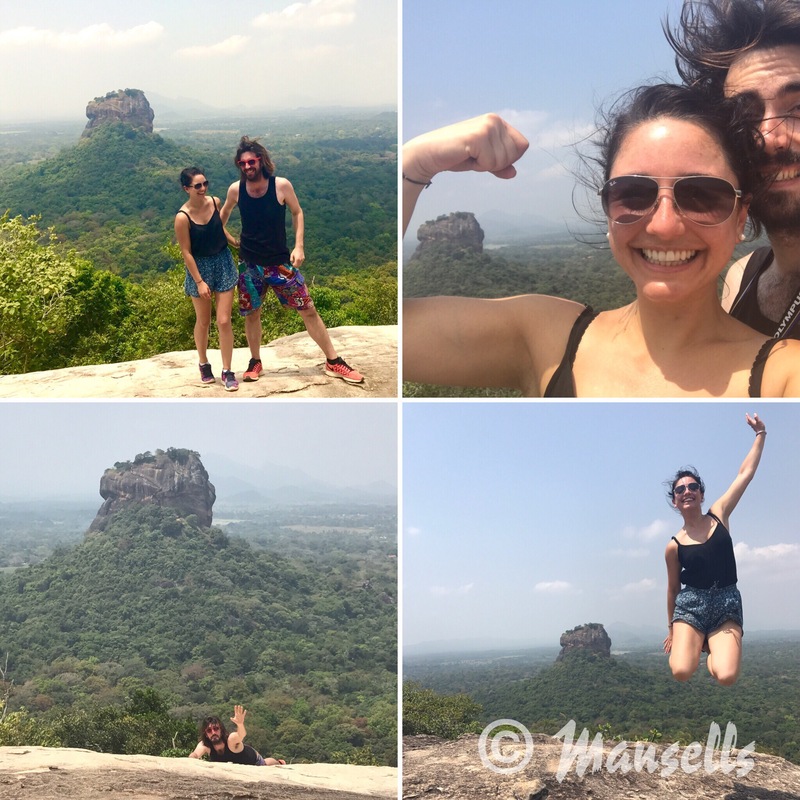 We planned to climb Pidurangala rock (another rock which overlooked Sigiriya rock) and see the Dambulla Cave Temples in one day. 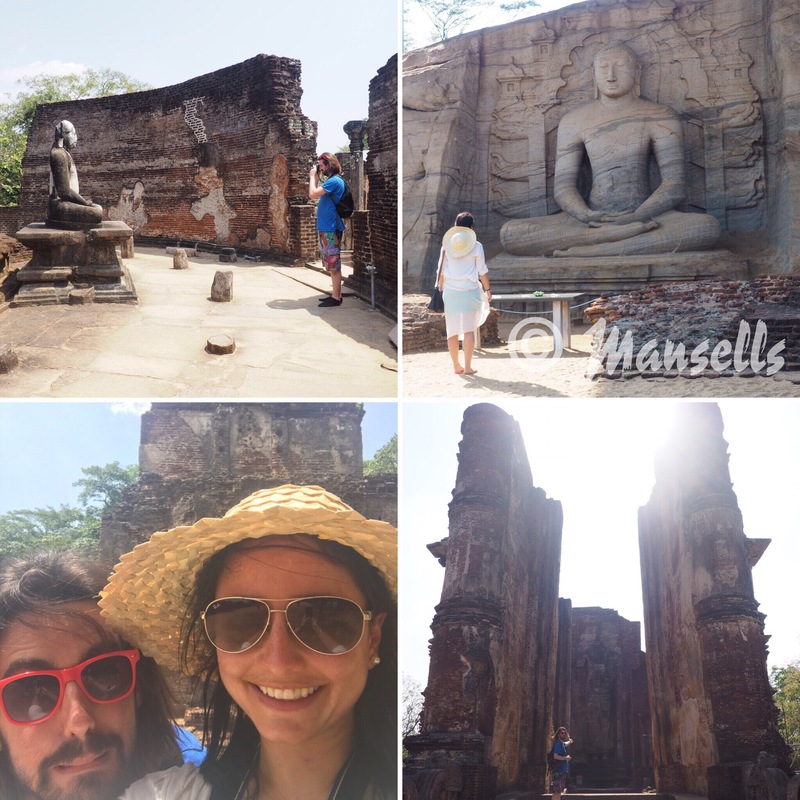 We got a bus to Sigirya, a tuk tuk to Sigiriya rock and then walked the 1.5 kilometers to the base of Pidurangala rock. You have to pay to climb up Pidurangala ($3.50 USD) but it is a fraction of the cost of Sigiriya rock ($30 USD). The views were stunning at the top. Larking about on top of Pidurangala rock. 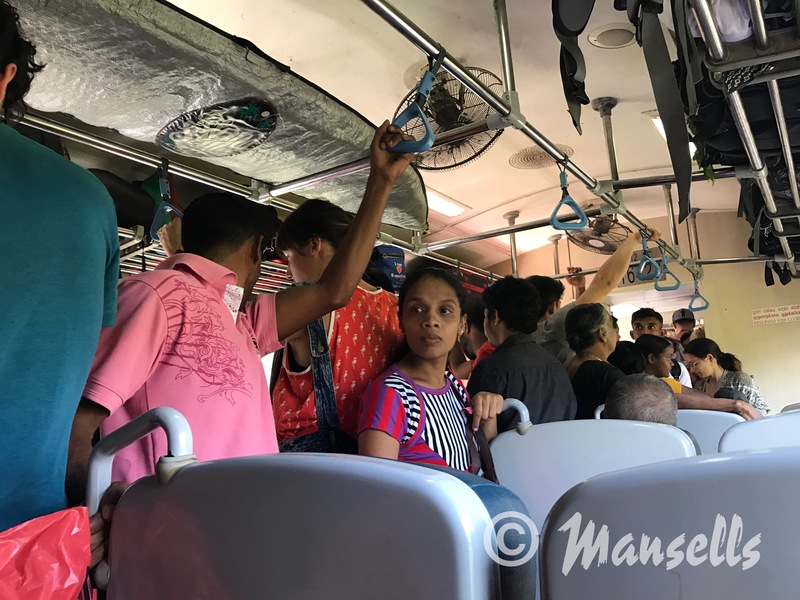 Once we had descended, we assumed we’d just walk to the main road and catch a bus or a tuk-tuk to the Dambulla Cave Temples. However, the road was really quiet, no shops and not much traffic so we proceeded to walk all the way back to Sigiriya rock in the heat. A tuk-tuk offered us 1000 LKR but that was far more than we had ever paid so we declined. We quickly learnt that this was the going rate as every tuk-tuk quoted us the same (I guess because it is a touristy area) so we bit the bullet and went for it. 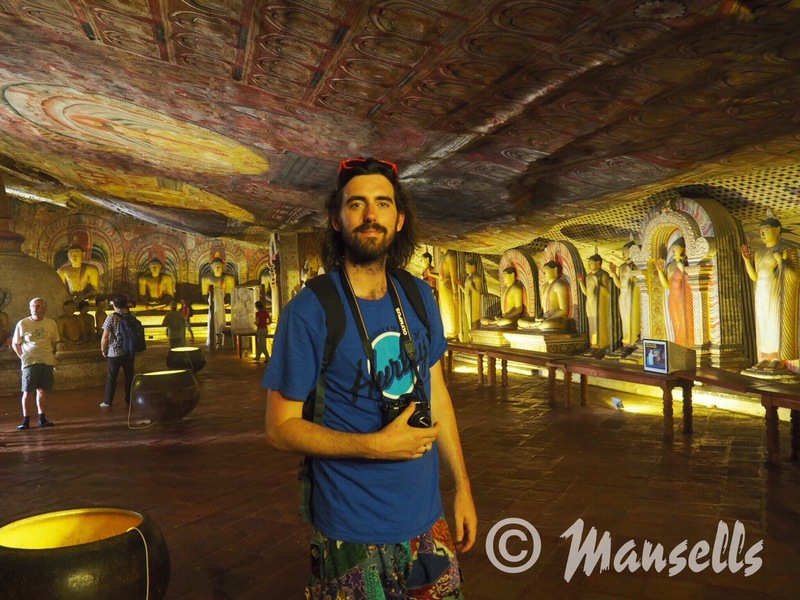 The Dambulla caves are ancient Buddhist temples with 153 Buddhist statues inside and paintings all over the ceiling. It is a world heritage site, with the caves dating back to the first century BC. The entrance is frustratingly round the back of the hill near the car park so we had to walk all the way up and over the hill to get there and back up again once we had got tickets (after climbing Pidurangala rock in the morning!). It really wasn’t clear and we saw a lot of people complaining because there are no signs to tell you. Once inside though, the 5 caves were mesmerising- buddhist statues all lined one-by-one and the intiricate paintings were beautiful. The only thing that could have made this better is if there was some information about the caves and their significance (we used the limited information in the Lonely planet guide book as a reference). Jonny inside one of the caves. The following day we spent in and around Polonnawura and cycled around the old city. This is where you can find huge Buddha statues (and it is disrespectful to turn your back on Bhuddha so definitely no selfies allowed!!). It was also my birthday so we treated ourselves to an evening dinner at the Cinnamon Lodge in Habarana which had a huge choice of fresh food and a room full of all-you-can-eat dessert (plus wine which we’d struggled to find anywhere). The ancient ruins in Polonnawura. A few birthday treats for Sara in Polonnawura and Habarana. We had been thinking our next stop would be Kalpityia for the kite-surfing and dolphin watching. However, upon researching how to get there, it became obvious that it would take a very long time with the route not entirely clear. We would also have to take another long journey back to Colombo for our flight to India. Therefore we bailed on Kalpitiya and chose Negombo, the closest beach to Colombo. We were a little scared this would be an overcrowded touristy resort town but when we arrived we were pleased to see it wasn’t so bad at all. It worked out well because we lucked out with a whole apartment at a reasonable price, with breakfast included. It meant we could do all our laundry and even did some baking as there was an oven! (Jonny became very excited finding out if you whisked egg whites they become stiff 😂). 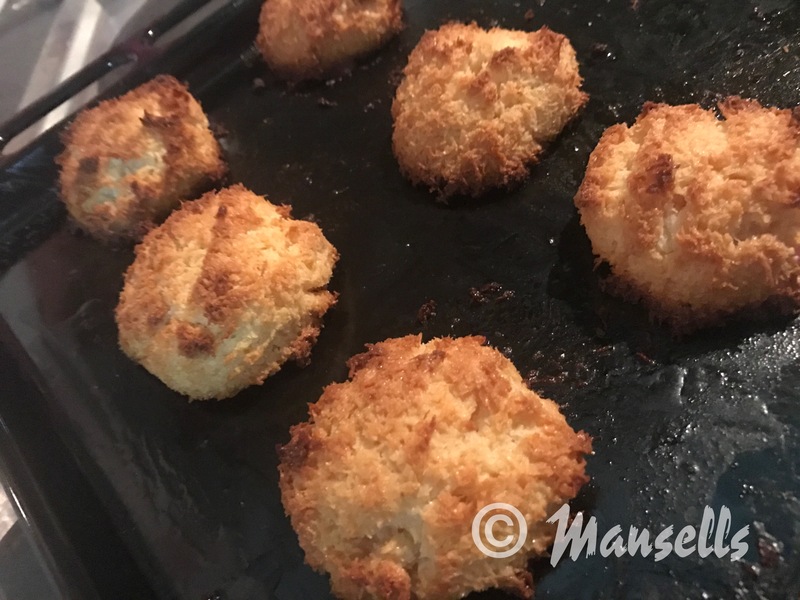 With so much coconut available, we made coconut macaroons and offered them to our hosts at Eco Green Villa. The beach was very sandy and we bought a day pass from a hotel resort for 1000 LKR (about £5) to use their towels, sun loungers, wifi, pool and toilets. It was such a nice way to relax at then end of a busy three weeks and before the next stretch of our journey in India! 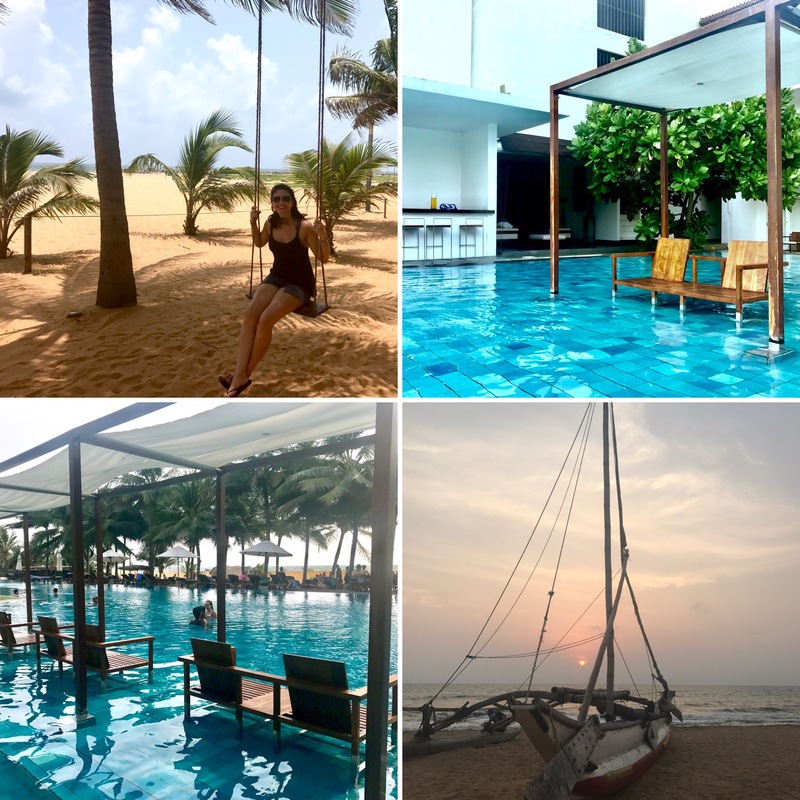 Negombo – our last stop in Sri Lanka! There was also a beach park that was popular with the locals and offered cheap local food. The egg hoppers were particularly tasty! 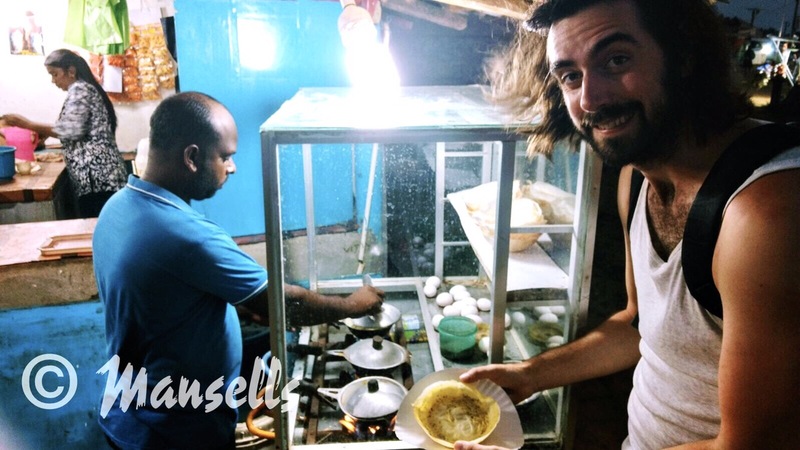 Jonny getting an egg hopper in Negombo beach park for around 50p! 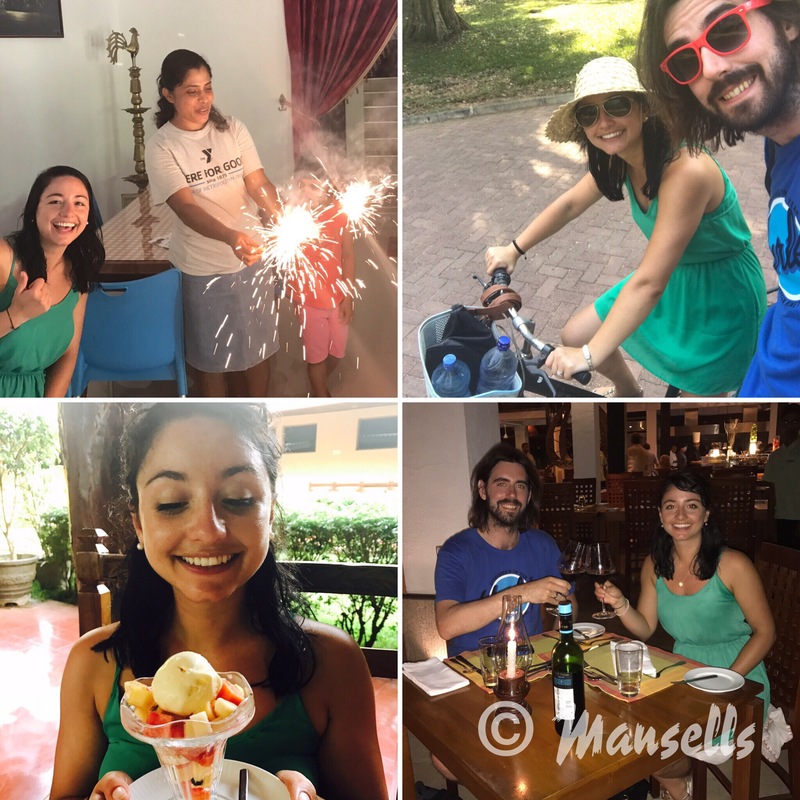 In summary, we loved every minute of our time in Sri Lanka and the diversity of the country made us feel like we had been there for ages. We’d definitely recommend a visit! Firstly, I should provide some background to our journey so far. 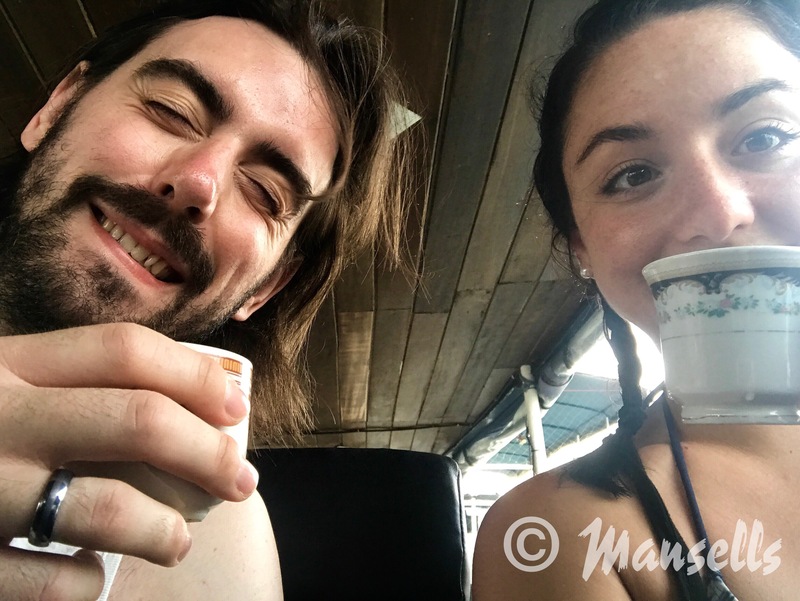 We are a married couple living in the UK, who decided to take a 6-month sabbatical or career break from our jobs to do some travelling! To make this sound slightly less glamorous, this didn’t happen without months of planning including saving for 18 months, deciding what to do with our rented flat and all our furniture, car (in the end we decided to end the lease and sell our furniture and car) booking the travel, budgeting, getting vaccinations and so on. Perhaps one day we’ll write a separate blog entry on the planning side alone as there would certainly be enough to fill it! 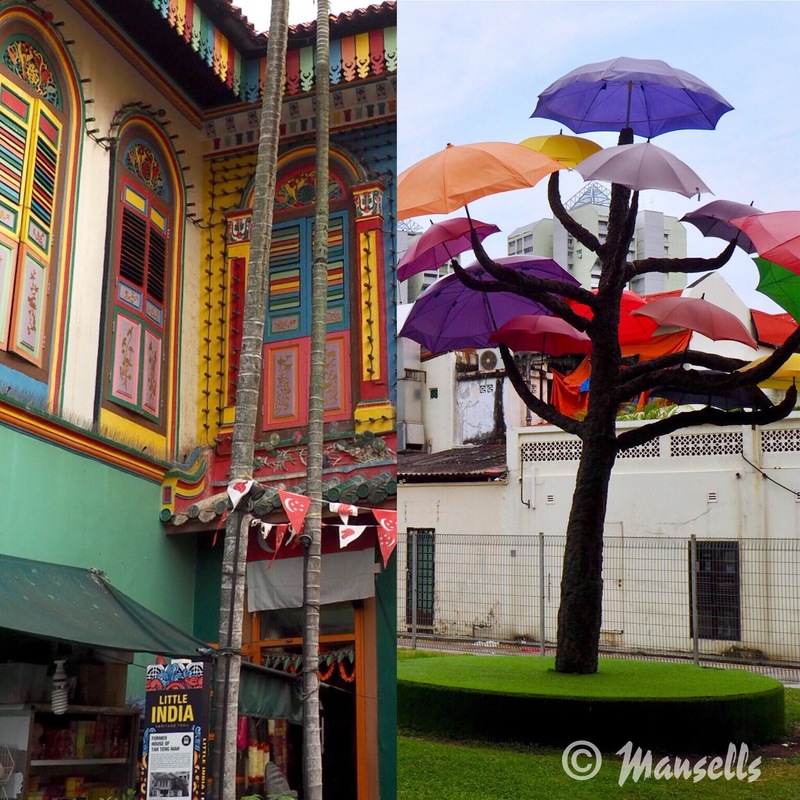 We made the choice to do two trips; the first one in Asia and the second in South America. 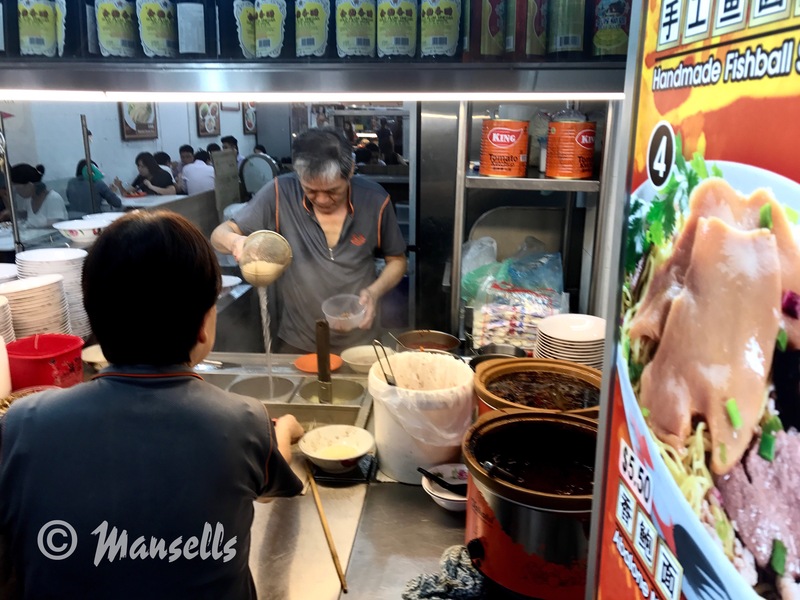 Our trip started on 5th April 2017 and our itinerary is three weeks in Sri Lanka, one month in India and then three months getting from Bangkok to Bali with a few days in Hong Kong on our way back to the UK in mid-August. 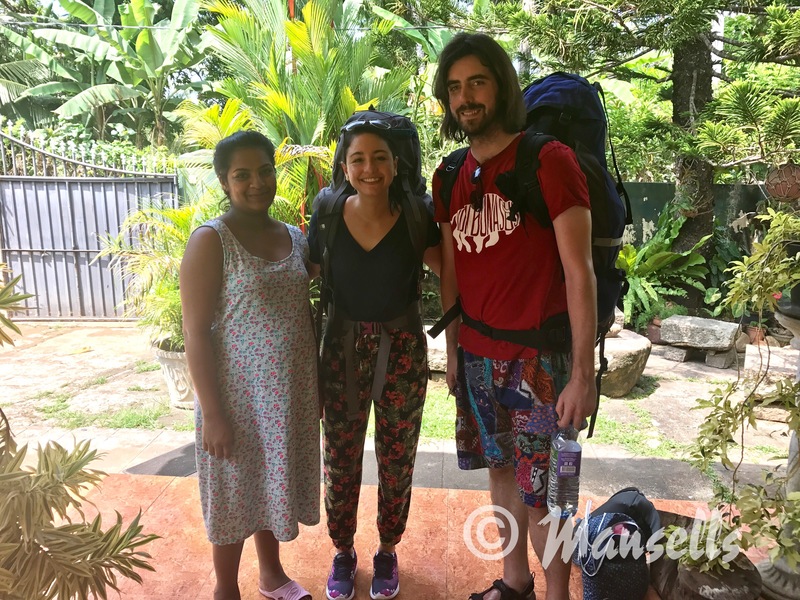 Our budget allowed for a typical back-packing style trip and that suited us because it gave us more flexibility to travel around. 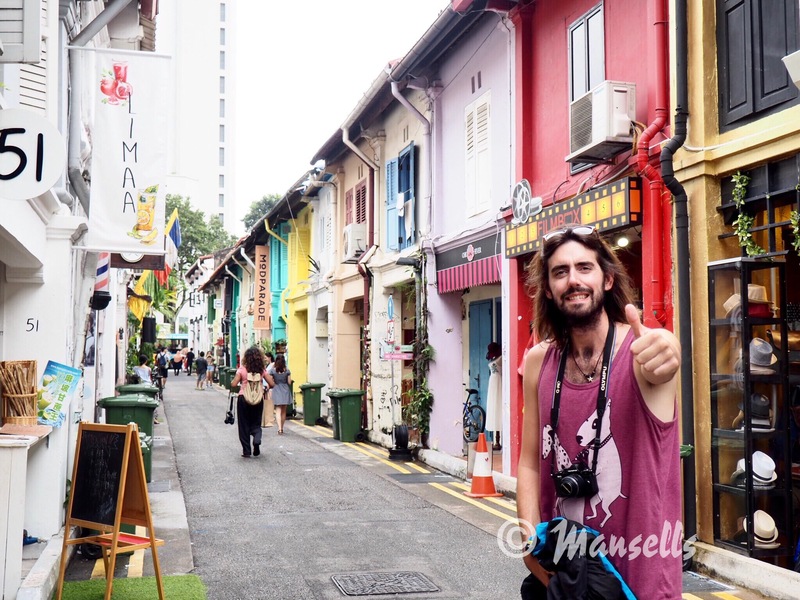 We booked all our main flights with STA travel as they offered a round-the-world ticket at a decent price and the option to move flights easily with their multi-flex pass. As for accommodation we just booked our first few nights via Booking.com and opted to leave the rest of the trip open. Photo: Us about to depart at Heathrow airport for our 4.5 month trip around Asia with probably far too many bags! So that’s us! 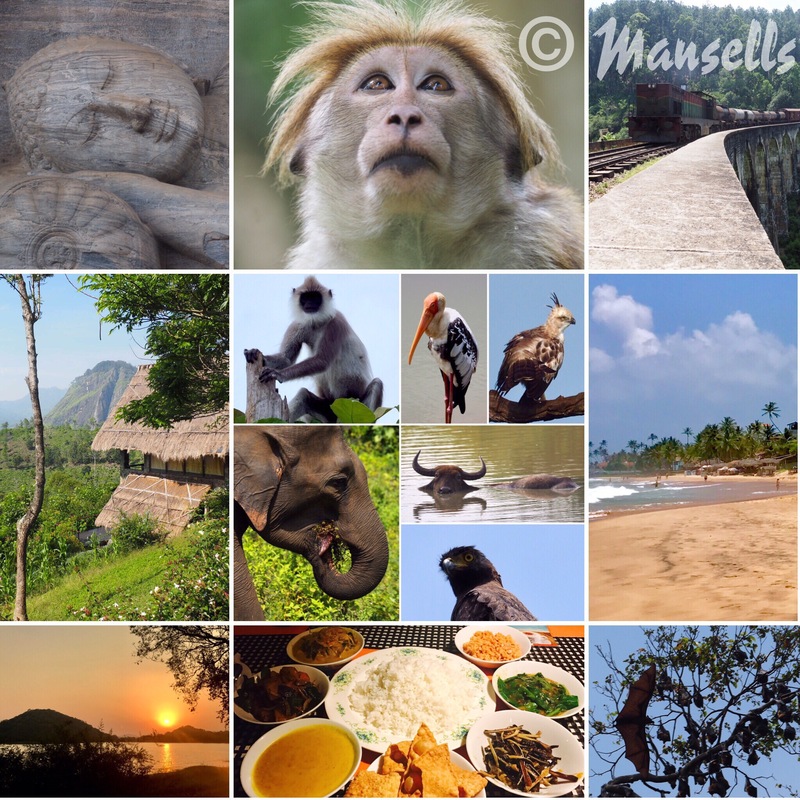 And now we have almost finished our 3-weeks in Sri Lanka which have been amazing! 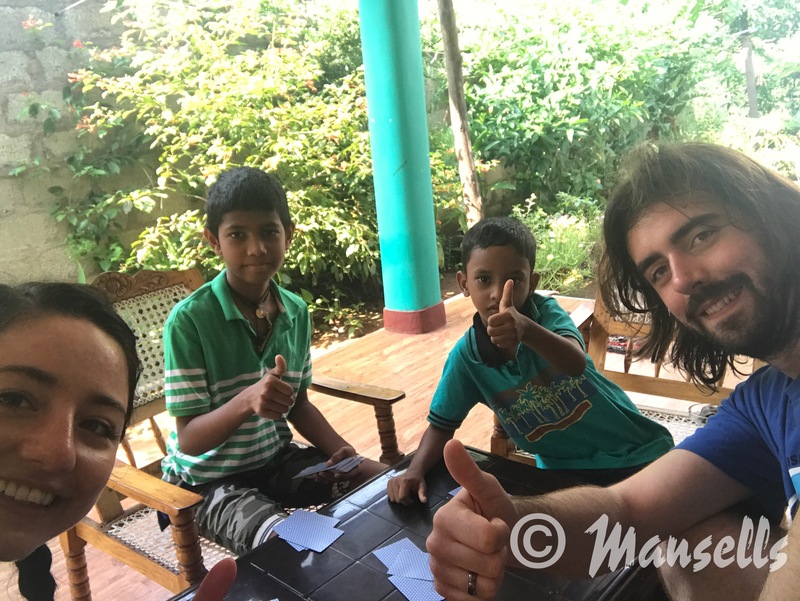 We really challenged ourselves by moving to a new destination in Sri Lanka every 2-3 days but that in itself has been a great experience to speak to lots of different people, stay in lots of different places and really get a sense of different regions in Sri Lanka. I think we’re both still in holiday mode and it hasn’t really sunk in that we’re out here until 22nd August so we know we may not be able to keep up that pace!